The developer of a more-than-$100-million condo project in Montreal is betting that its natural setting, the new Champlain Bridge and a new light-rail station will help sales pop. 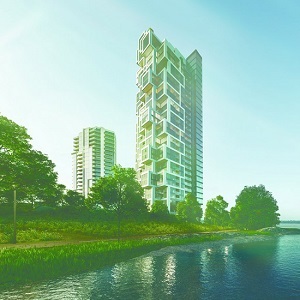 Construction is slated to begin next summer on the 32-storey Symphonia POP tower on the southern tip of Nuns’ Island, just off the Champlain Bridge. The building will feature 240 units selling from $250,000 to $2 million and will open in 2020, after completion of the new bridge and shortly before the scheduled 2021 opening of a new REM (Réseau électrique métropolitain) station on Nuns’ Island. The building will be located on the banks of the St. Lawrence River, next to a golf course and each unit will have water views in perpetuity. Barring traffic jams, Nuns’ Island is a 10-minute drive from Montreal. In addition, the new REM station on the island will be five minutes away, allowing residents a short commute downtown by public transit. Symphonia POP will be located next to Symphonia’s first phase, completed in 2014. It consists of 25 floors and 171 condominiums. Market conditions in Montreal are much more favourable than they were a few years ago, he says. There has been a reduction in the amount of time resales are on the market, prices are starting to increase and the economy is doing well. Founded in 1972, Westcliff has a portfolio of more than 10 million square feet of leasable space in Canada and the U.S and about 10 million square feet of land for future development. Its projects include regional and super regional shopping centres, office towers, industrial properties, condominiums and apartments in Quebec, Ontario, Nova Scotia, Newfoundland, Labrador and Dallas. The POP in Symphonia is named after superimposed cubes, called pops, which will jut out horizontally in units on the north side of the building. Units will range from 600 to 3,000 square feet and from one to four bedrooms. There will also be penthouse apartments with rooftop terraces and some two-storey residences. Features include indoor and outdoor pools and Jacuzzis, an all-day gym, sauna and steam bath, 24-hour security, meeting room with full kitchen, a yoga room, games room, pool room and three levels of indoor parking.